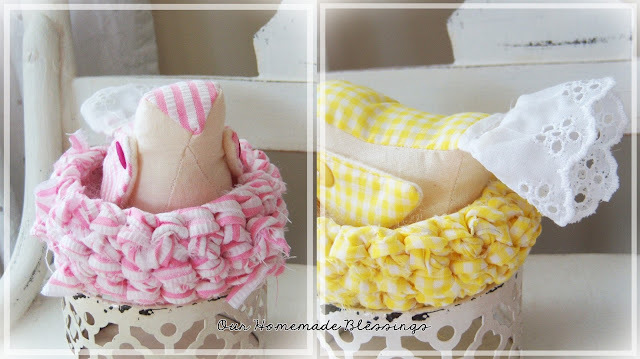 Shoregirl's Creations: Shabby Chic Nests! Sharing two birds/nests I made for the Etsy shop. I crocheted these nests from fabric and made the tiny birds with wings to match. I think my favorite part is the lace tail -- it was kind of an after thought, but I love how it turned out! Pretty pastels - all ready for spring! Just too, too adorable. I love your little birdies perched every so prettily in their gorgeous nests! !